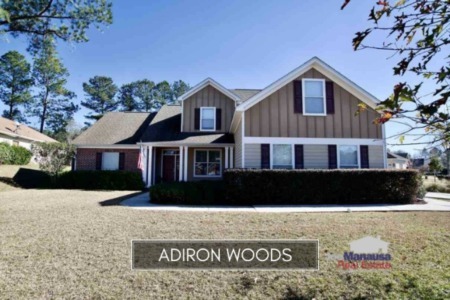 Located on the East side of Tallahassee just off the intersection of Mahan (Hwy 90) and Walden Road, Adiron Woods is a new construction neighborhood that has joined the list of most active neighborhoods in the real estate market for the past 7 years. Adiron Woods has homes built from the 2006 to present, with the types of amenities that has attracted buyers willing to pay for the bells and whistles of a new home. Just as we have reported for other "boom neighborhoods," it also means that there will be natural move cycles hitting many of the homeowners here at the very same time. Hopefully the market will recover enough to take them in stride. 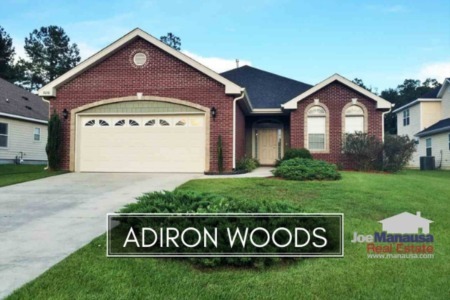 In this report, we will look at prices, values, and sizes of homes in Adiron Woods, as well as show current listings in the Tallahassee MLS and all closed home sales going back to 2002. For the 3 real estate graphs utilized in this report, you will observe the number of closed home sales for each year (blue columns, measured on the left vertical axis), and an important real estate statistic shown in red (measured on the right vertical axis. It is important to note that sales are through December for all previous years, but through October in 2014. Average home prices have begun rising again since hitting a low in 2011, but are still highly attractive for buyers at $100,000 below the high set back in 2007. Distressed sales are are occurring at a rate consistent with other neighborhoods in Tallahassee, but primarily due to the fact that only half the sales are coming from existing home sales. This means that an above average number of resale properties are selling in distressed situations (is this a surprise when values decline so greatly in a boom neighborhood?). The average recorded sales price is $248,000 for Adiron Woods thus far in 2014. Home sales activity this year is far lower than the past two years, which were as good or better as any year during the housing market bubble. New neighborhoods will have their own pace, so we'll keep a close watch on Adiron Woods. Thus far in 2014, there have been just 8 closed home sales. Average home values in Adiron Woods have fallen 5% since last year, after having recovered nicely since the low set back in 2011. Through October, the average value of a home sold in Adiron Woods has been $130 per square foot. This is up 33% over the bottom reached in 2011, but still down about 17% from the market high set back in 2006. This means that many homeowners (who have all purchased or refinanced in the past 8 years) are likely at zero or negative equity situations and would be "distressed" if they entered the market today. The average home size sold in Adiron Woods typically falls in a range of 1,700 to 2,300 square feet, and this year home size averages are just below the average. The 8 sales thus far in 2014 have averaged 1,909 square feet. The following list of homes are the most recent listings in Adiron Woods. A red box will appear when no homes are listed for sale in the Tallahassee MLS, but check back again on a regular basis as this page updates twice daily. The following list shows home sales going back to 2002 in Adiron Woods. I hope you enjoyed our November 2014 update on home sales in Adiron Woods, please feel free to drop me a note if you have questions not covered in this report.